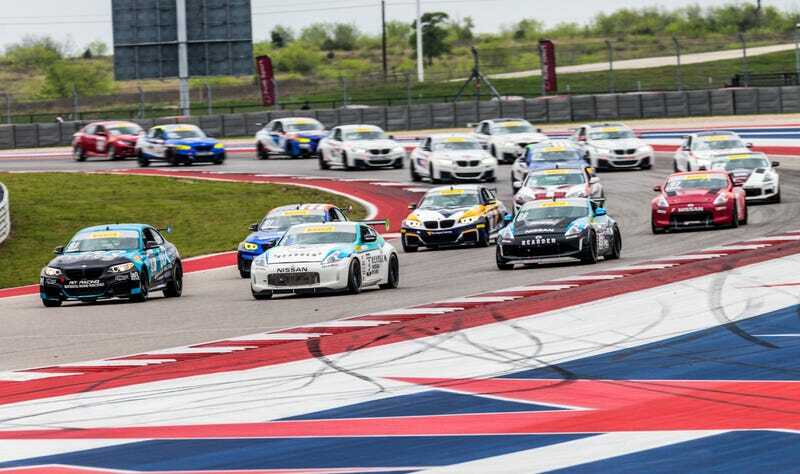 Pirelli World Challenge has been visiting Circuit of The Americas in Austin, Texas for five years, and each time the series delights fans with a ton of sports cars across several classes. Stef Schrader and I were on the ground all weekend, covering several cool stories, and providing Jalopnik Bumps not once but twice, and I’ve picked out a bunch of pictures I felt like sharing with you all. Last year the COTA stop on the calendar was in September, which was hotter than hell, but this year they switched back to a March weekend like they had in years past. While the conditions may have been more favorable, but the action on track was as hot as ever. Here. Have some car pics. It’s the car time. Longtime Jalopnik fan favorite, and successful Jalopnik Bump recipient in his other race car, an NSX: Ryan Eversley. Your usual motorsports photographer and occasional writer is handy in a fast car too. This was just a tease though. Tom O’Gorman felt the magic of the Jalopnik Bump. The next stop for Pirelli World Challenge is at Long Beach, for one of the best race weekends a fan can attend. They share the famous street circuit with the Verizon IndyCar Series, IMSA’s WeatherTech Sportscar Championship, Formula Drift, Stadium Super Trucks, and Trans Am. I’ll be there too, following another story we’ll be featuring next month. Keep your eye out for that one.